In a case that brings to mind the current situation in Nigeria, the former Ivorian First Lady Mrs Simone Gbagbo has been sentenced to 20 years in prison for organizing post election violence after her husband, Laurent Gbagbo lost out in the 2010 Presidential elections in Ivory Coast. 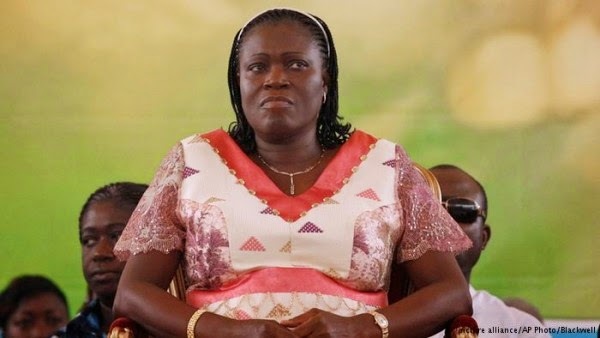 In a unanimous judgement today March 10th, the jury at an Ivorian court said Mrs Gbagbo together with her husband's supporters, after rejecting the results from the elections that saw her husband's main rival, Alassane Ouattara declared winner of the election, carried out activities that undermined the state security which left over 3000 people dead. Simone Gbagbo was tried alongside 82 other allies of ex-President Laurent Gbagbo. Gen. Bruno Ble, who headed the elite Republican Guard, and former Navy Chief, Adm. Vagba Faussignaux, were both jailed for 20 years. Pascal Affi-N’Guessan, President of Gbagbo’s Ivorian Popular Front (FPI) party, was also handed an 18-month suspended sentence. Dadje said the sentence handed down by the six-member jury, was longer than the 10 years requested by the state prosecutor. He said the former first lady’s rights, were also suspended for 10 years. However, Simone Gbagbo is still talking tough. She said she had been insulted and humiliated by the prosecution, which, she said, had failed to prove her guilt. The former first lady added that she told her part of the truth, and would forgive if the right thing is done.